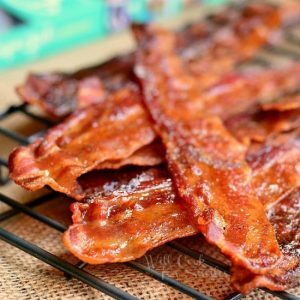 This is one amazing bacon recipe! This is Oven Baked Bacon, flavored with a mixture of maple syrup and Dijon mustard and spiced with black pepper. This recipe is from my brand spanking new cookbook from Lori at Recipe Girl! This is the BEST bacon I’ve ever tied. I don’t know how I’ve never thought of flavoring bacon and our world has been turned upside down! You probably noticed that I have Lori’s new cookbook in my Mother’s Day Wish Basket Giveaway(ENTER HERE). If you haven’t noticed, this means that you haven’t entered yet and you must! It’s such a fun gift basket and I teamed up with 18 other bloggers, who all have their own basket to give away. You can enter for a chance to will them all. The best part about my basket, is The Recipe Girl Cookbook. Lori is such an amazing chef and I’ve been following her for my entire blogging career. When I was starting out, as a blogger who didn’t know squat about blogging or photography, I started following a few great, established bloggers. Lori was one of the first food bloggers that I “fell in love with.” When I saw that she was releasing a cookbook, I couldn’t wait for the release date. When I was getting my mail last week, I noticed the package with this cookbook. I got so excited that I even forgot to get the groceries from the car. I ran up the stairs and started flipping through the book. As I was sitting there, I got a creeping feeling that I was forgetting something. Ummm…yea…groceries! Luckily, I only got sidetracked for about ten minutes, but it still made me laugh. I hope you will be this excited when you get your signed copy from Lori in my giveaway! I don’t own many cookbooks, just a few classics. I gotta say, Lori’s book will put them all to shame. It is such a well planned and organized book, I’ve been combing through it for days. She covers all the basics for stocking your kitchen: from pantry, to liquor cabinet, to kitchen tools. I absolutely love the little section in each recipe that shows you how to substitute or change up ingredients to play with flavors. Many recipes also have suggestions on making it gluten free or dairy free. A few days ago, I was yet again looking through the book and husband noticed a bacon recipe. That man and his bacon…He noticed this bacon recipe from across the room! Of course, I had to make it first. I thought it was such a great idea to mix maple syrup and Dion mustard and brush it on bacon while it’s cooking. I’m not proud to admit it, but we ate the entire package of that bacon that day. Not all at once, but all in one day! I have a feeling that we are going to feel this way about every recipe that I make from this cookbook! This is Oven Baked Bacon, flavored with a mixture of maple syrup and Dijon mustard and spiced with black pepper. Preheat the oven to 400 and line a rimmed baking sheet with aluminum foil, covering it entirely and up the sides. Place a rack in the baking sheet and lightly spray it with cooking spray. Lay out bacon strips on top of the rack and cook it for about 15 minutes. Meanwhile, whisk maple syrup and Dijon mustard together until combined. 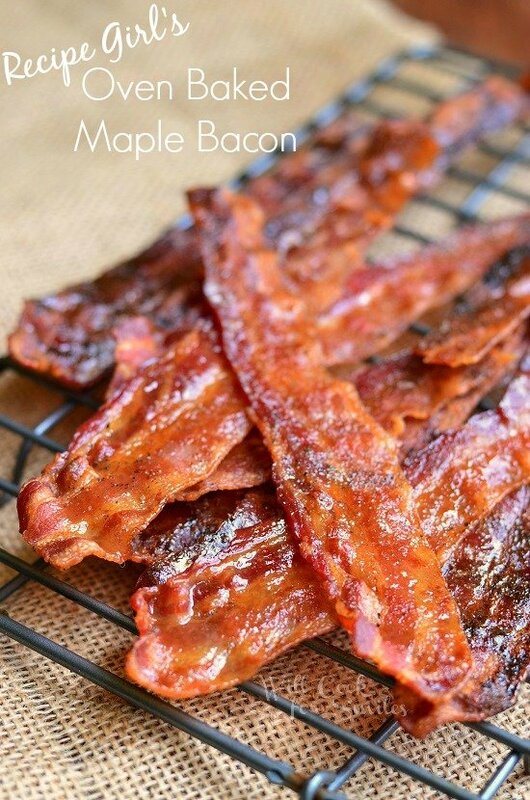 After bacon has been cooking for 15 minutes, take it out and brush it with maple/Dijon glaze. Season bacon with some freshly ground black pepper. 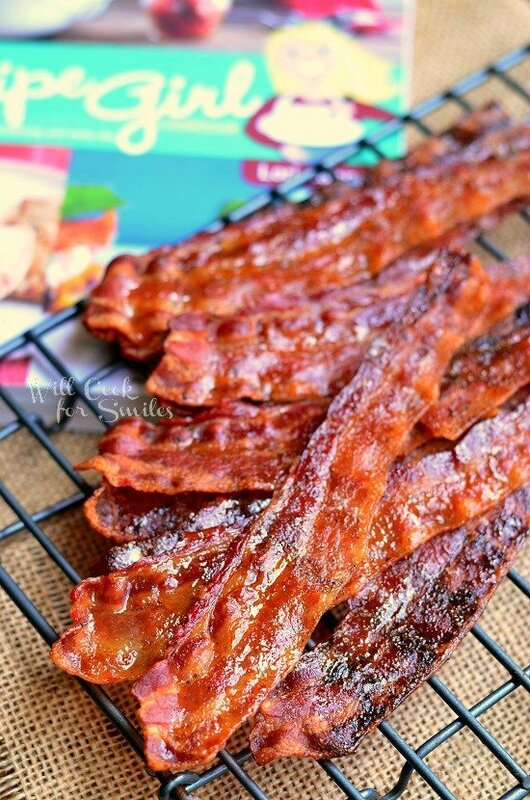 Take the bacon out of the oven and lay the strips out on a paper towel. This recipe is from The Recipe Girl Cookbook and has been posted with author's permission. The photographs are from Will Cook For Smiles. Do not copy either without a written permission. I love bacon and I’ve never thought about doing it this way. My honey loves hot stuff so how about a chipotle seasoning instead of pepper? Yum!! And since I think you are tops in my book as far as blogging and food I will go take a peek at Recipe Girl’s site. I am always learning from you. Have a great day and I will be sure to sign in for the basket. You are so sweet Marisa! Thank you! Go for it with chipotle seasoning and the best part is that you can do a few for him with chipotle and a few for yourself with something else at the same time. Sounds wonderful and easy! How do I sign in for the basket? 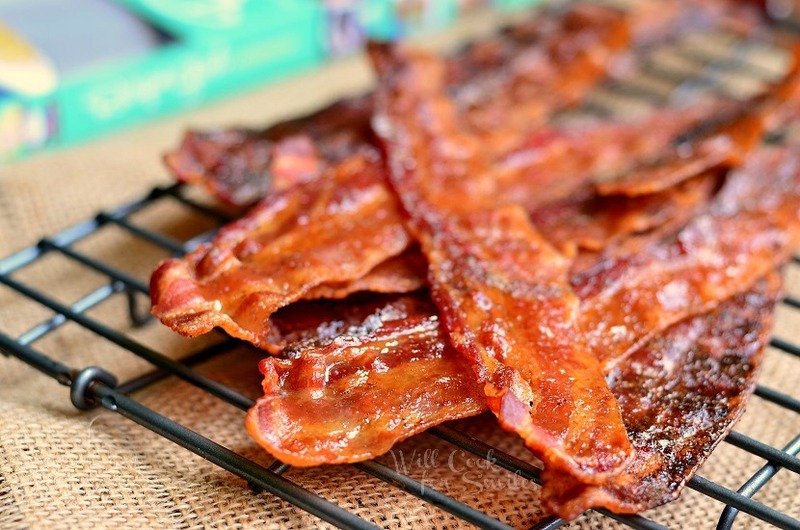 Baking bacon in the oven is such a great method! And that maple/dijon/pepper glaze sounds so good! I’d love for you to link up at the #GetHimFed Fridays party. The party is open until Sunday evening. Hope to see you there. This bacon would be loved by all.